Katoh M and Katoh M. Identification and characterization of human FMNL1, FMNL2 and FMNL3 genes in silico. Int. J. Oncol. 2003; 22:1161-8. Yayoshi-Yamamoto S, Taniuchi I and Watanabe T. FRL, a novel formin-related protein, binds to Rac and regulates cell motility and survival of macrophages. Mol. Cell. Biol. 2000; 20: 6872-81. Favaro PM, Traina F, Vassallo J, et al. 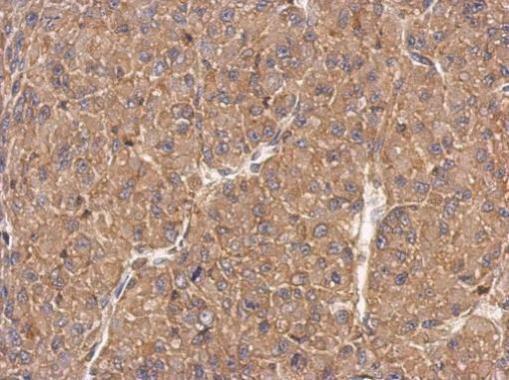 High expression of FMNL1 protein in T non-Hodgkin’s lymphomas. Leuk. Res. 2006; 30:735-8. Gomez TS, Kumar K, Medeiros RB, et al. Formins regulate the actin-related protein 2/3 complex-independent polarization of the centrosome to the immunological synapse. Immunity 2007; 26:177-90. 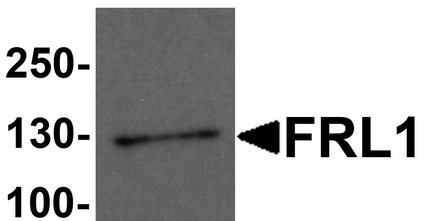 Western Blot analysis of FMNL1 expression in transfected 293T cell line (H00000752-T01) by FMNL1 MaxPab polyclonal antibody.Lane 1: FMNL1 transfected lysate(50.93 KDa).Lane 2: Non-transfected lysate. Sample (30 ug of whole cell lysate). A: Raji. 5% SDS PAGE. TA308659 diluted at 1:1000. Immunohistochemical analysis of paraffin-embedded U87 xenograft, using FMNL1(TA308659) antibody at 1:500 dilution. 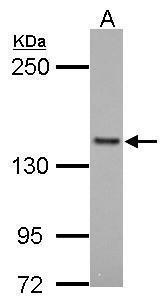 Western blot analysis of FRL1 in EL4 cell lysate with FRL1 antibody at 1 ug/mL. 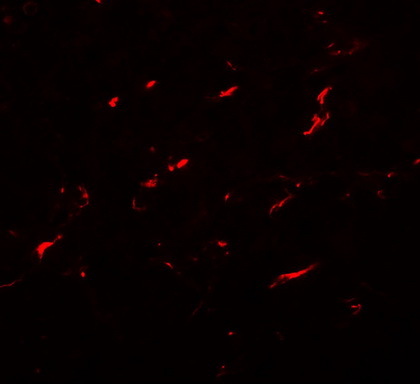 Immunofluorescence of FRL1 in EL4 cells with FRL1 antibody at 20 µg/mL.